BookGlutton is now supporting Safari and looks excellent! 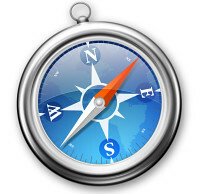 Safari is available for both Macintosh OS X and Windows and outperforms both IE7 and Firefox. And it makes pages look great. The Safari rendering engine, WebKit, just got an A+ rating on the Acid3 test, something no other browser has done yet. What does that mean, to a non-techie? …That Safari is the most standards-compliant browser out there, and we officially recommend it for reading in BookGlutton.